Species placed in this group are either those with appendages between the corolla lobes, or those with small corollas covered densely with hairs such that the corolla itself is obscured (largely the genera Trichantha and Bucinellina). 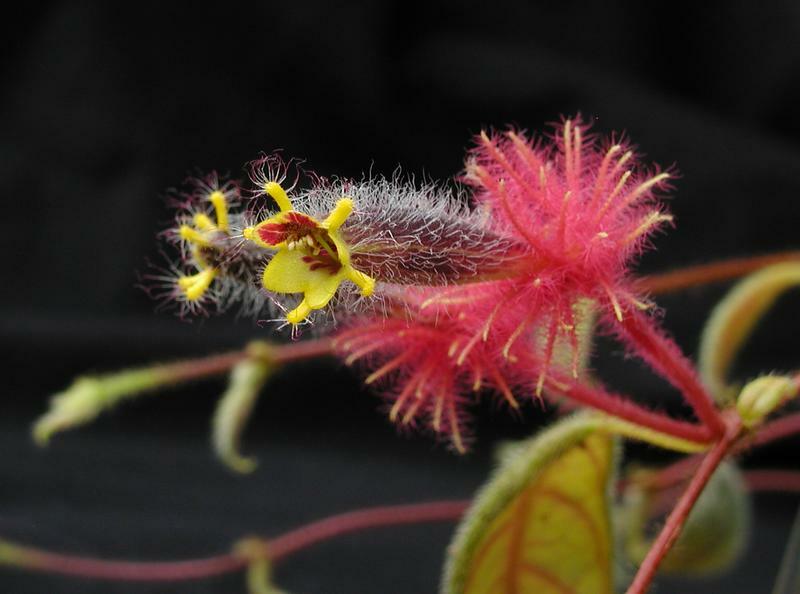 Columnea minor, formerly known as a Trichantha, usually has a finely divided bright red and hairy calyx, creating a spectacular effect. Columnea minor often typifies this section. This species is relatively common and widely distributed in Colombia and Ecuador. The calyx is deeply divided (fimbriate) and covered densely with hairs, giving the appearance that the flower emerges from a puff-ball. The appendages that occur between the lobes of the corolla are found in many, but not all species in this section. The function of these appendages remains only speculative, presumably affecting the types of pollinators that visit the flower. This section is also likely to be divided in the future. Some species hold together well, such as those with wide calyx lobes (C. pulchra, C. herthae, C. pygmaea), but others including the type species for the section (C. anisophylla) are not closely related.